Delaware County, PA Vietnam Veterans Memorial: Lost and forgotten for over forty years, this very unique memorial has been discovered and is being given new life by Pennsylvania veterans. Brandywine Creek in Pennsylvania is known for the Revolutionary War defeat of General Washington’s army by the British on September 11, 1777. 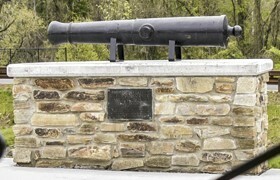 Unknown patriots who wanted to honor those from Delaware County who were fighting in the Viet Nam war thought it appropriate to combine a cannon from the Revolutionary War with their plaque of remembrance dedicated on November 11, 1966. 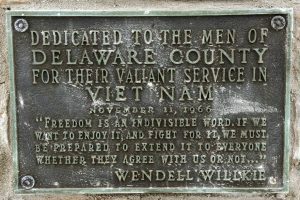 With Wendell Willkie quote “For if we want to fight for freedom, we must be prepared to extend it to everyone whether they agree with us or not….” The monument was recently discovered over grown with brush in an abandoned parking lot and was rededicated on October 15, 2016 on a pedestrian crosswalk near the newly constructed Brandywine Mall where it serves as an impressive reminder of the gallantry of warriors from both wars. And proving It is never too late (or too early) to honor warrior service. 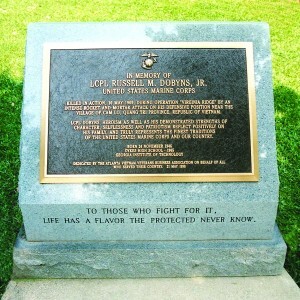 Author’s Note: In researching Vietnam Veterans Memorials for Warriors Remembered I compiled a list of over 1000 memorials. I always tried to avoid claims of which was “the first” because I felt every memorial was a labor of love regardless of its date of birth. 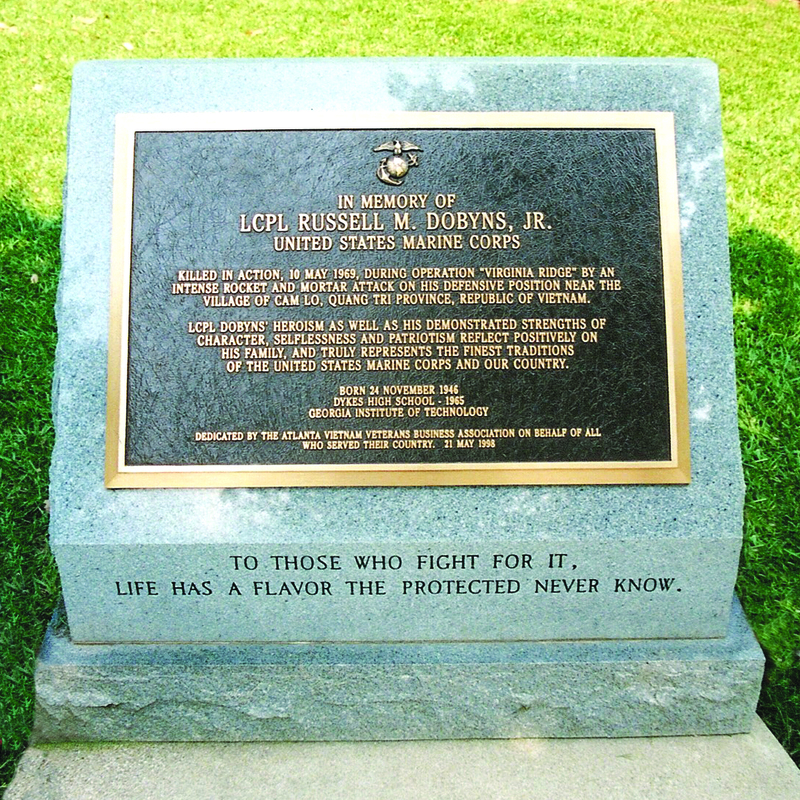 The oldest memorial I found to include in Warriors Remembered was the one in Calumet City, Illinois dedicated May 30, 1967. This memorial near Brandywine battlefield dedicated seven months earlier clearly eclipses that distinction. My next blog in a few weeks however will point to an even earlier memorial. My congratulations to every group of veterans and their supporters who have built or continue to build these monuments of remembrance for our fallen and surviving brothers. So often I am told how hearing a sample of the emotional stories in Warriors Remembered helps bring the book and its memorials to life and makes people realize that it is far more than simply pretty pictures. Unfortunately I am not able to travel to every location that has invited me to make a presentation and do a book signing. I have now posted a YouTube video of my presentation to reach those far distant from Sugar Land, TX in hopes of making more people aware of the impact Warriors Remembered has had on the veterans’ community and many patriotic civic groups. You are welcome to use this video if your organization needs a speaker or simply to share it with your friends. 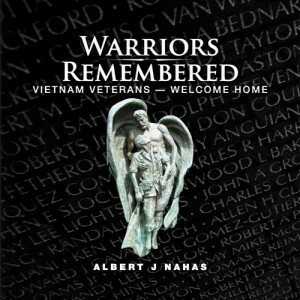 And of course, books are available from www.warriorsremembered.com if you would like to read the 90 other stories in Warriors Remembered. Warriors Remembered receives outstanding review from MWSA. 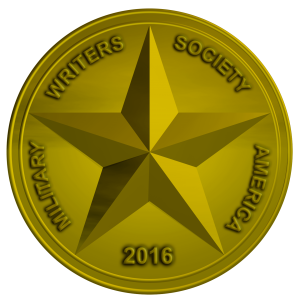 The Military Writers Society of America (MWSA) has given a glowing review to Warriors Remembered. An organization of hundreds of military writers, the MWSA’s review is the closest thing to a “peer review” that this photo documentary of Vietnam Veterans Memorials could receive. Read the full review below. Warriors Remembered: Vietnam Veterans–Welcome Home by Albert J. Nahas is a wonderful pictorial journey to several veterans memorials around America. Mr. Nahas provides the history of the efforts of those involved in creating monuments to the memory and sacrifice of those who fought for our country, in particular to those who shared the Vietnam experience with him. He was drawn to include those who fought or served in all our wars, men and women alike. It is a coffee table book in the truest and best sense of the description. His photography is the next best thing to being at these places in person. Sugar Land, Texas April 25, 2016 – An anonymous donor has purchased 67 copies of Warriors Remembered that have been distributed to Fisher Houses worldwide. Fisher Houses offer free lodging for families of veterans receiving care at Veterans Administration or military hospitals. 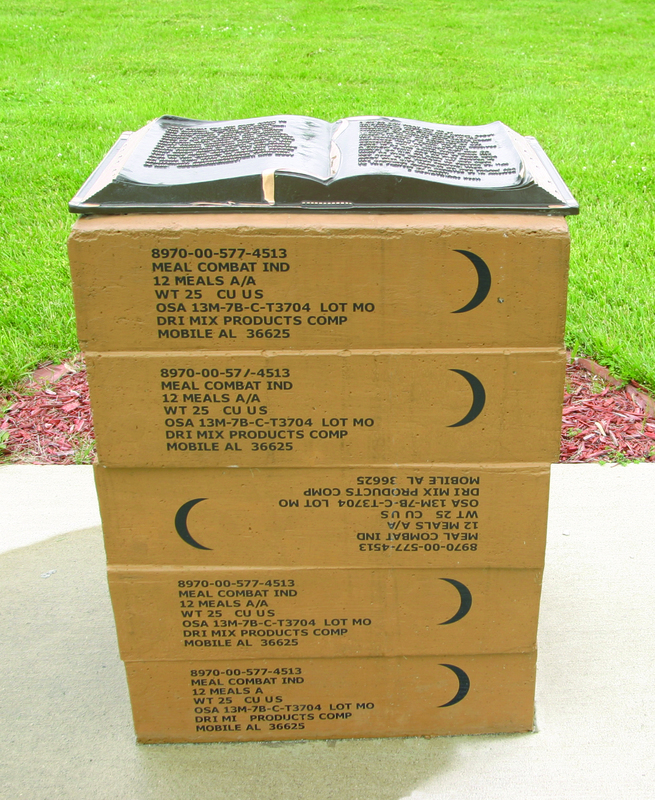 Constructed by the Fisher House Foundation, they are donated to the VA or branch of service operating those hospitals. Warriors Remembered is a photo documentary of 100 Vietnam veterans memorials from all 50 states. Warriors Remembered and the Fisher House Foundation share a mission of offering a “Thank You for Your Service” and Welcome Home for all veterans and both recognize the significant sacrifices of veteran families. Colonel (Ret) Albert J. Nahas, a Vietnam veteran with the 101st Airborne Division from July 1968 to February 1970, spent six years and 35,000 driving miles touring the United States, photographing memorials and interviewing those who created them. From his list of over 1,000 memorials, he selected 100 to represent and honor those who served, were killed or remain missing in Vietnam and the veterans, friends and families who sacrificed in the face of often adverse public opinion to create memorials to honor their fallen brothers in arms. The donor, a veteran of the Texas Air National Guard, has long admired the sacrifice of all warriors who fought our nation’s wars. 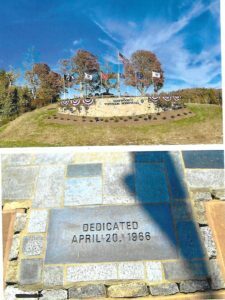 He attended a Warriors Remembered presentation and book signing by Colonel Nahas and took to heart his stated mission of publicizing these memorials often unknown even by veterans living nearby. The book’s stories bring the memorials to life and are meant to kindle continued healing for veterans and for the Nation from the divisiveness of that time in our history. 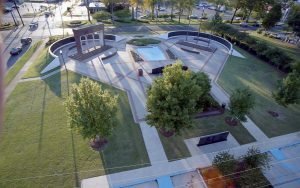 Warriors Remembered also presents the legacy of the Vietnam War in relation to our nation’s current conflicts. The donor’s desire to assist with this mission led him to partner with Colonel Nahas and both agreed the Fisher Houses would be an ideal venue to reach veterans and their families. Warriors Remembered was released on Veterans Day, 2010 and is a 240-page, hard cover, coffee-table-format photo documentary of 100 Vietnam veterans memorials from all 50 states. With over 285 photos it tells the stories and captures the struggles and dedication of those who created the memorials. The book also highlights unique features of each memorial that might be missed by a first-time visitor. These memorials are for the dead, but more so for the living. They are meant to be visited. Most of them were built for Vietnam veterans by Vietnam veterans. That war’s combat veterans are a declining generation which adds urgency to the mission of publicizing these memorials for their benefit and for the benefit of all families affected by war. The book is dedicated to all American Warriors and to Colonel Nahas’ twenty-nine West Point classmates who were killed in that war. 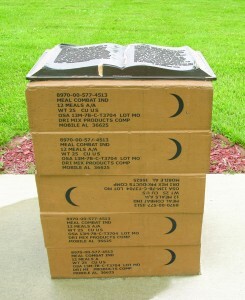 Warriors Remembered can be previewed at www.warriorsremembered.com Colonel Nahas will gladly sign any book purchased. Fisher Houses www.fisherhouse.org provide military families free housing close to a loved one during hospitalization for an illness, disease or injury. 8We do not want you to be uninformed, brothers and sisters, about the troubles we experienced in the province of Asia. We were under great pressure, far beyond our ability to endure so that we despaired for life itself. 9Indeed, we felt we had received the sentence of death. But this happened that we might not rely on ourselves but on God, who raises the dead. 10He has delivered us from such a deadly peril and He will deliver us again. On Him we have set our hope that He will continue to deliver us, 11as you help us by your prayers. Then many will give thanks on our behalf for the gracious favor granted us in answer to the prayers of many.